varieties and amperage ratings for any car stereo system! Our fuses are universal and will work with any aftermarket fuse holder with styles including AGU, ANL, MAXI and MIDI models available. 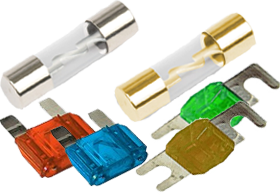 All fuses are available with either a platinum or gold finish to match any install.